North Korea, also known as the Hermit Kingdom where 24 million people are closed off from the world living under the Supreme Leader Kim Jong Un live in a world unlike many . The defectors of this country have experienced or witnessed inhumane and malicious acts for most of their lives and finally have the voice to tell the horrific stories behind one of the world's most isolated countries. After the fall of Japan in World War II , Korea had been caught in the Cold War ,and while the northern region was controlled by the communist regime of the Soviet Union The United States had influence over the southern sphere. The first of the Kim family is Kim Il-sung whom had fought alongside the Soviet Union in World War II and following the war went back home and ran for president of his country. 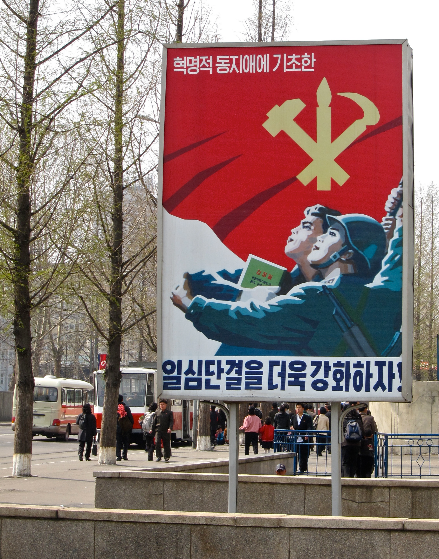 It is critical for a North Korean citizen to extensively be knowledgeable of the "Great Marshal" and his family that it is to be memorized and recited at an early age. According to Jihyun Park, North Korean defector , " There are children who learn about the dictatorship before they learn the value of their family, or before they remember their mother or father’s names. Jihyun had fled from North Korea due to the great famine that occurred in the late 90's that had caused her family to starve to death , Jihyun and her brother fled the country leaving behind their dying father ,and to never return again. Jihyun tells The Independent in an interview stories such as hers are common in North Korea. Among the thousands of North Koreans that reside in South Korea many have difficulty adjusting to everyday life, while buying groceries or going to the cinema may seem mundane to average citizen it is foreign and strange to a defector. Teenage defectors are shocked the most by their sister country South Korea by the drastic contrasting lifestyles between North and South. Without any sort of insight on the outside world they are amazed by plastic cards that hold money and fast food like hamburgers and pizza and the food results indigestion. They are unaware of the difference between mouthwash and laundry detergent. In addition, to the trials of defectors adjusting to life , all adult defectors must forego psychiatric therapy for three months while learning their rights under South Korean law , and other basic skills to adjust to society. Teenagers can spend two months to two years at remedial boarding school Hangyoreh Middle-High School due to difficulty with basic reading and math. Education in North Korea is useless for life in this country," said the school's principal, Gwak Jong-moon. Life in the "Hermit Kingdom" is much like it was after the Korean War, majority of the country is unaware astronauts have landed on the moon , television has over thousands of channels, and most of all life does not revolve around the supreme leader. Reporters and journalists have been allowed entry into the country ,but with very strict rules. They allow foreigners to see what they want you to see and have guards beside you at all times. Among the various rules of outsiders into country it is forbidden to photograph any of the supreme leaders without consent and the picture must be full body only. The restrictions and rules for a foreigner are absurd the rules the North Koreans live by are even more ludicrous. Girls are not allowed to ride bicycles , religion is banned entirely and considered a threat to the state , and viewing western movies is a crime punishable by death says Mina Yoon , a North Korean defector . Western movies smuggled in the country are seen as a "mortal sin" to the state and those who have the films use the utmost caution by covering windows with a "thick duvet" and locking their doors with more than two locks. Human rights is an alien word and unimaginable to the citizens of North Korea , happiness and love is unfamiliar, and freedom is unimaginable. What do young college student, know about North Korea , LSSC student Stephen C. replied to this question by saying," I haven’t heard anything recently about North Korea". Perhaps there is not much coverage of North Korea on the news , another LSSC student comments "the news focus is more directed towards NK as a threat and focuses less on its people." The unfortunate people trapped inside North Korea have two choices in life; live a normal Korean life under the rule of the Supreme Leader Kim Jong Un struggling to survive and constantly living in fear or taking a life or death chance in hopes of escaping and not being captured and taken back ,but with hope of a better life. Struggling to survive in the country with famine and brainwashed ideas and lies being coerced inside their minds with no sense of freedom or rights they are isolate from any outside help. Fortunately, programs and organizations like Liberty In North Korea, NKFreedom , and HelpingHandsKorea that help North Korean refugees adjust to civilian life is an enormous and impactful way to help and spreading awareness of what life is in North Korea. There are various ways to get involved by giving donations , fundraising , joining a rescue team, and also opening your hearts to the refugees to display kindness and warmth they have not experienced . The citizens of North Korea are prisoners to their own minds and ignorance, and due to no fault of their own they will never forget life in the "hermit kingdom" .